This desk is up for auction, and it will probably sell for a lot. You may ask: Why should I be interested in this random looking desk? Especially one that looks like a post-apocalyptic dystopian assemblage, maybe whipped up in somebody's garage? Well you should be interested. 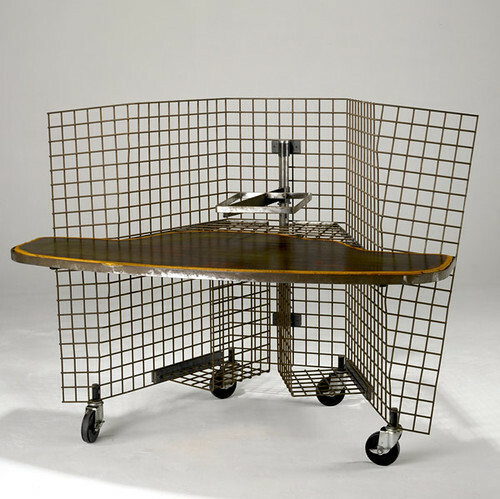 This desk is an artifact of perhaps one of the most radical experiments in office environments ever let loose on the American workplace. Sometime in the mid-nineties (pardon me as I'm just going to recount and not fact check) Jay Chiat, partner of the Chiat Day advertising agency set out on a mission to create the ultimate in modern and flexible workplace. First in the Los Angeles office, and then later in the New York office, new workplaces were created that left all convention behind. First, nobody had a desk. Nobody even had a computer. Well you had a computer, but not your own computer - all your files were stored on a company server. When you got to work in the morning you checked out a laptop and a phone at the main desk and then set off to roam the office landscape. That landscape included desks, and cafe tables, meeting rooms, project spaces - both conventional and unusual work environments. No personal space, or at least no permanent personal space. It was a wild experiment, one that took great faith in the responsibility and behavior of the staff to let the organization loose in such a loosely organized workplace. Meanwhile the New York office was a similar yet completely different experiment. There they brought on italian designer Gaetano Pesce to completely design the space for this new working environment. They were going to do the full monty here. A new way to work was not going to be hemmed in by the same old office furniture. They would design an environment specific to this new office model. And design it he did. It was something like a carnival meets a spooky Fellini nightmare, from the glossy poured resin floor, to walls made of bricks molded to look like cell phone faces, funky custom made chairs, and yes - funky custom made mobile desks. And now you see from whence this unusual desk came. The natural follow up question is why are they selling one of their desks? Don't they need these in the funhouse to get their work done. Well, not anymore. There is no question the places worked. I won't say they worked great or wonderfully. By they did it, even if they weren't digging it. It was described as being like an ongoing cocktail party. People would be asked to sit in a different spot each day by Chiat to force "it" to happen. People could not locate their coworkers for days. Some staked out territory, some abused the freedom, but generally they worked with it. It played out in sometimes horrible, sometimes wonderful, but almost always unexpected ways. Eventually there was a change of ownership of the Agency, and along with that a new management team who unsurprisingly just did not get it. And so it came to an end. I'm not sure how all of the unusual furnishings from the New York office were liquidated. Some things no doubt went to MOMA, but for the most part I suspect the stuff just went away. So the fact that this desk has surfaced, and is probably going to auction for a lot of money is both a surprise, and is telling. and yes, we did touch on this briefly in this post about Malcolm Gladwell's book. The desk itself is actually very interesting. Made of bent welded wire mesh it has a shelves below the top for the CPU, and an adjustable perch for screen. The desktop is a unique poured resin top as were many of the other surfaces in the office space. Top it all off with sturdy castor wheels and it really was a forward looking workstation.